When you work in neighborhoods undergoing significant, rapid change, it helps to get a little creative with your research and data sources, especially as we move further away from the last census. Here are some of our favorite (and fun!) tools that we use to understand what’s been happening in the communities where we work. Let us know in the comments what tools you use to understand neighborhood change. Yelp’s new Wordmap (launched yesterday!) 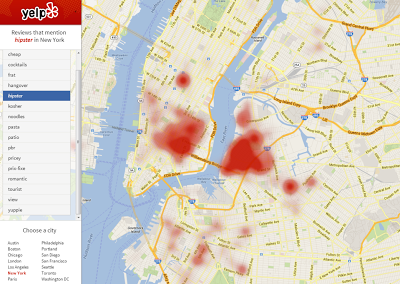 shows density of keywords used in Yelp reviews around different cities. These maps are helpful in understanding characteristics and mix of local businesses, and the consumers in each of these neighborhoods. They may also prove useful if you’re searching for prospective retailers to bring to your community, or for businesses that are considering expanding into new markets. They also reveal some subtle differences in clientele (Williamsburg has a density of Hipster businesses, while Park Slope and Prospect Heights are more appealing to Yuppies) and regional differences (Yelpers like to eat/review Biscuits in Portland, OR, Hoagies in Philadelphia, Dim Sum in San Francisco, Poutine in Toronto, and Bacon just about everywhere.) We hope they’ll add in a timeline feature so we can see how these clusters change over time! Google Trends allows you to see how, when, and how often people have been Googling different terms (since 2005). We use this to evaluate any “buzz” around a neighborhood, and to see how communities stack up against one another in terms of search popularity. See below how NYC’s five boroughs have trended over the past eight years. 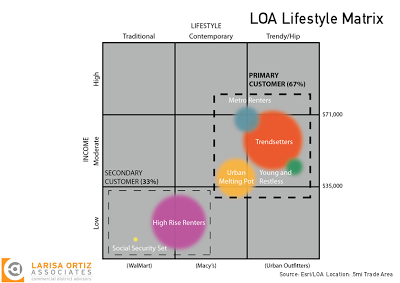 Inspired by retail guru John Williams approach to tenant mix analysis, we’ve created the LOA Lifestyle Matrix that we use to plot both customers (using psychographic data) and retailers in a particular commercial district by Income/Price and Lifestyle. 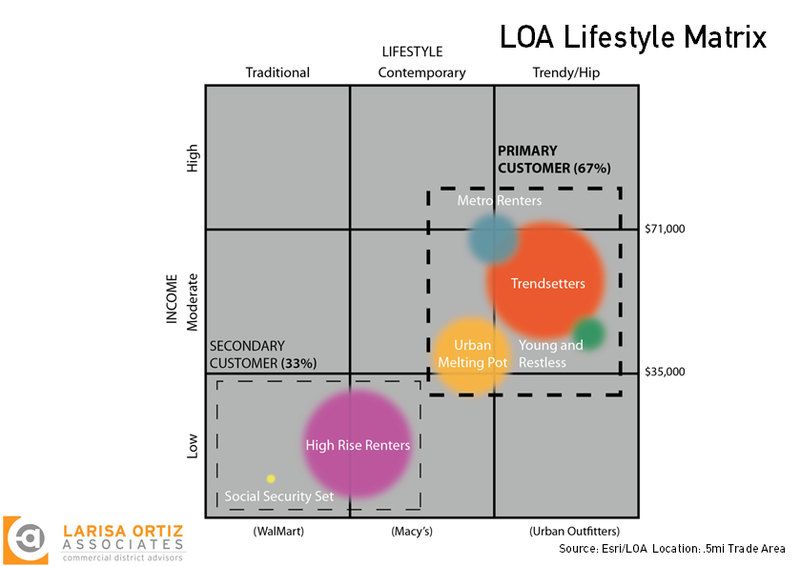 By overlaying these two data points, we can visualize fairly quickly how well stores in a particular place are meeting the needs of their community, and what consumers want (do they want an expensive trendy store like Opening Ceremony, or one that is trendy but inexpensive like Rainbow? Is this a J. Crew shopping district or a Talbot’s kind of market?). We can then identify any mismatch between offerings and customers, and use that insight to both attract the right mix of new retail, while also helping retailers adapt to neighborhood change. Even if you don’t have access to psychographic data, try creating your own matrix with census data, Yelp reviews, and other free sources. So much of urban development is influenced by access and proximity to transit. 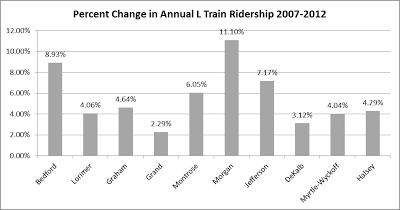 In New York, the MTA collects annual ridership by station. 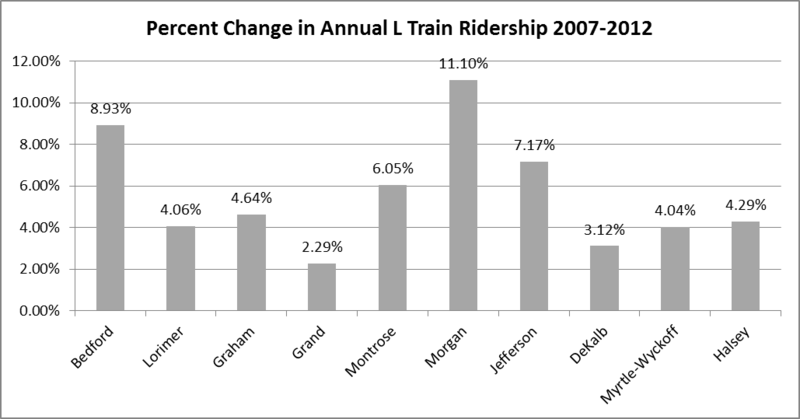 Using this data, we can see where the most significant increases in ridership are happening, which can help us understand where new activity and investment is taking place and project what neighborhoods might be next. Property Shark maps the change in price per square foot of residential properties by neighborhood. This helps to illustrate where new investments are being made, and what neighborhoods are struggling, stagnant or soaring.